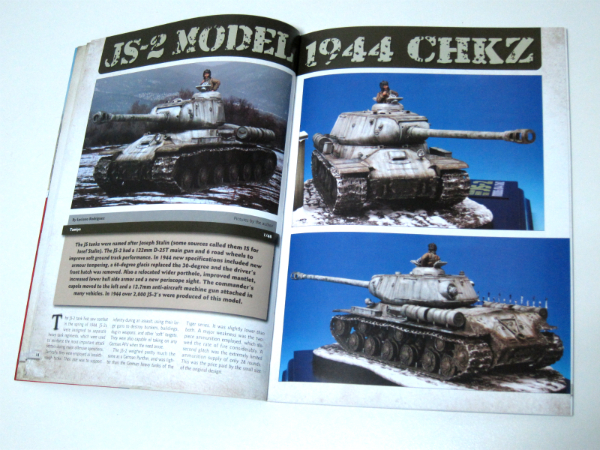 Accion Press / Euromodelismo – available in English! 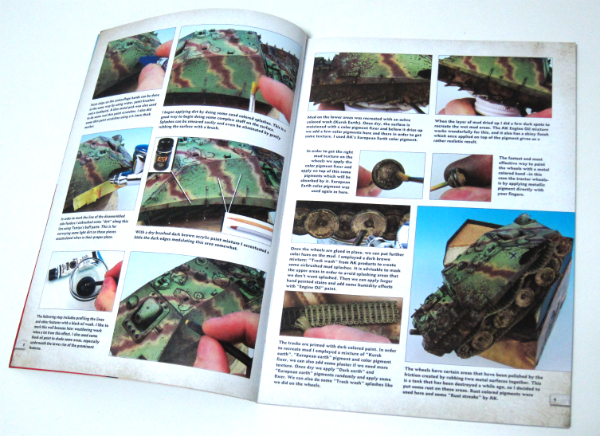 Accion Press (AKA Euromodelismo) is a publisher who is probably more familiar to European modellers, and possibly even specifically Spanish modellers, than to their North American or British counterparts, but that should change soon with the introduction of English versions of their most popular titles. 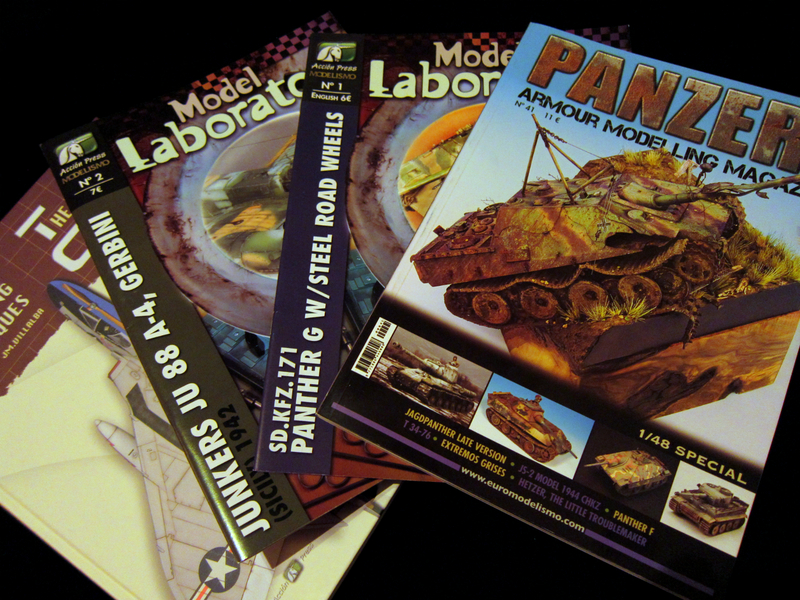 I picked up a few copies of their “Panzer Aces” and “Model Laboratory” magazines, and the book “Aviation Modeling Techniques – The Greatest Guide” at a model show near Madrid this past weekend and would like to share a review on these “hidden” gems with my North American modelling freinds. I’ll start with “Panzer Aces” since it’s a title that some of you may already be familiar with. Reviews of other titles will follow in later posts. 65 Full color pages printed on heavy matte stock with deep color illustrations that have a satin clearcoat, I assume to enhance the depths of the photos. The articles are light on history and background material, which I appreciate. Let’s be honest, most modellers have book shelves full of research material that address vehicle design and service history. I always end up skipping through the paragraphs of background historical information (which is usually presented elsewhere in greater depth anyway) that displaces valuable modelling-specific material so I can get to the modelling project, the”meat” of the article if you will. That’s not to say that there isn’t any background material present, but what is there is succinct and not intended to fill space. Each build is heavily illustrated with key steps documented with copious captions describing the process. The models are photographed on simple backgrounds and are well-lit with high image quality throughout the magazine. 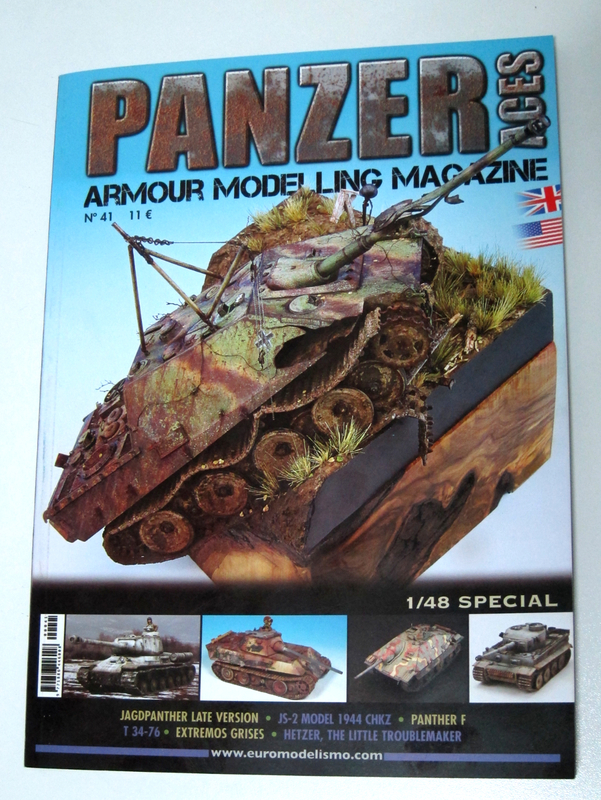 Considering that all the models in issue #41 are 1/48th scale (it IS the 1/48th scale special issue after all!) the quality of the models and the photography is outstanding! 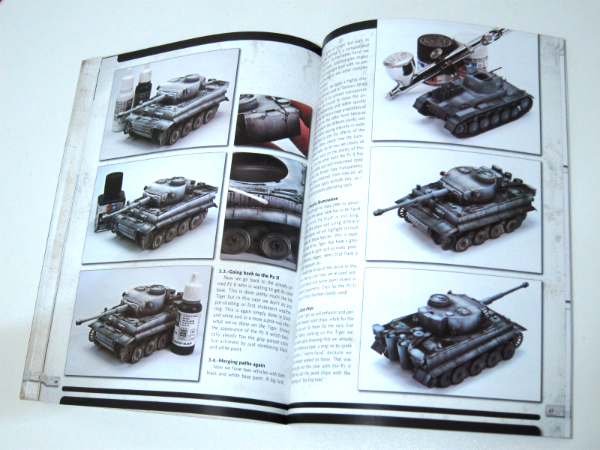 I had to read the “1/48 SPECIAL” text on the cover before I realized I wasn’t looking at 1/35 scale models! The magazine is also almost entirely free of advertisements. The text is clean and well edited. The translations to English from the original Spanish text are, for the most part, well done. This can be tricky in a technical field like armor modelling and I am glad the crew at Accion Press have gone to the trouble to broaden their audience, even if they don’t “nail it” (try translating that into a different language and have it make sense!) every time. Diego Quijanos Jagdpanzer wreck vignette. Mr. Quijano is up to his usual outstanding level of work with this exciting piece which features Tamiya’s kit modified to represent a wrecked and abandoned beast that has come to rest in an unusual and dynamic attitude. The model is heavily weathered but in away that doesn’t seem out of line with the vehicles disposition. The addition of some simple scratchbuilt elements enhance the kit details and some creative styrene work replicates the shattered plate steel and mangled barrell of the wretched beast. The finish has a depth that astounds (in my opinion the characteristic feature of the style known as “The Spanish School”) A well executed base brings it all together and displays the model in an attractive fashion. Luciano Rodriguez Winter white-washed JS-2. Does another article about a white-washed heavy leave you thinking “seen it – NEXT!” ? Well settle down and take another look. Mr. Rodriguez ditches the Aqua Net and dusts off his enamels to simulate a well-worn white-washed vehicle. The results have depth that have me wanting to try this technique on some other types of faded and streaked finishes. Mr. Rodriguez walks us step-by-step through the finishing process and concludes with the construction of a simple but attractive base that includes mud and snow using materials that the author is using for the first time. The fact that he achieves such satisfying results with materials unfamiliar to him inspires me to try my hand at new materials and techniques. Mr Lopez works his pre-shading magic on a pair of panzer gray vehicles to contrast different approaches using the same technique on models of varying sizes, in this case a Tiger 1 and a Panzer 2. For those of you unfamiliar with Mr. Luis-Ruis’s work, this article alone is worth the purchase price of the magazine. Applying a base coat of white and black that is followed by gray (in the case of one of the vehicles) and then finishing off with skillful weathering results in an eye catching depth that makes it hard to believe that the model is 1/48th scale. My description here simply does not do the work justice. Like a tank drove through an art store and came out…awesome!. Mr Johnston employs acrylics, enamels, oils, and pastels to replicate a tight feathered camouflage on this small, especially in 1/48 scale, Hetzer 38T. The camo is tight but soft and the colors are clean and bright. The weathering is well done and each step in the finishing process is well described. Another work that has me eyeing my kit collection looking for a suitable test bed. 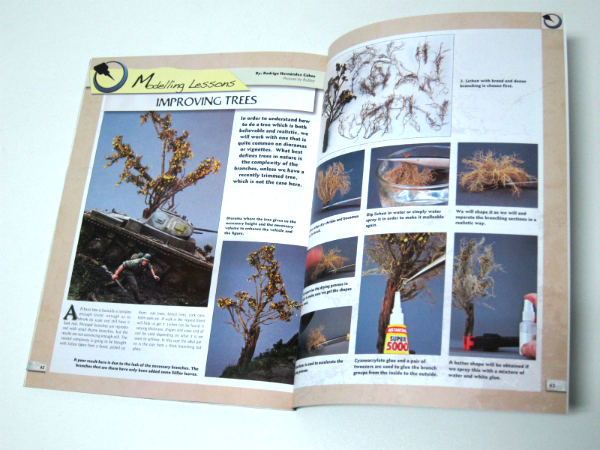 To wrap it all up Mr. Cabos shares a step-by-step on improving the appearance of trees for dioramas. The method uses easily obtainable natural materials and has me wanting to take a walk in the woods for materials and inspiration. Overall I think that this magazine is a great value considering the quality of the models, photos, captions, and overall quality of the printing. I did notice a couple of minor graphical issues, as well as the occasional awkward translation, but nothing that detracted from my overall enjoyment of the magazine.